Kamal Nath's Congress govt in MP is probing allegations of irregular appointments, wasteful expenditure, violation of UGC rules & unauthorised changes in curriculum. 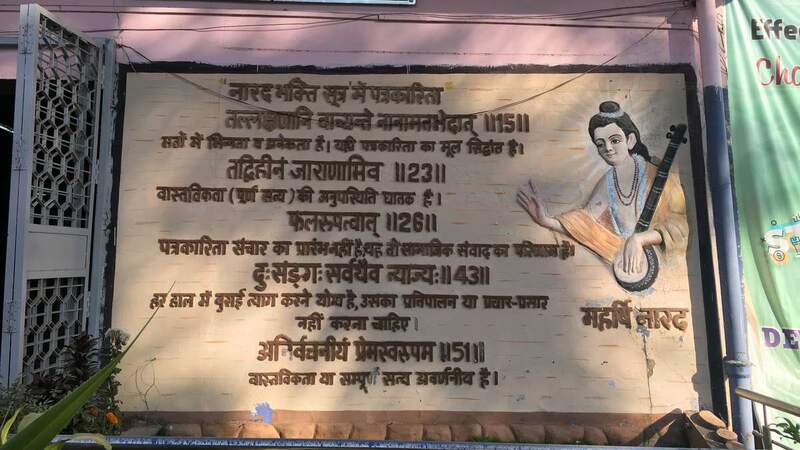 Bhopal: As one enters the Makhanlal Chaturvedi National University of Journalism and Communication, a mural of mythical sage Narad greets the eye, accompanied by Sanskrit couplets from the Narad Bhakti Sutra. But the words of wisdom of the mythical sage may not be enough to rescue the nearly-three-decade-old university from the serious trouble it finds itself in. The university has been accused of a series of wrongdoings including wasteful spending and ‘saffronisation’ of the syllabus when the BJP ruled Madhya Pradesh for 15 years from 2003 and the allegations are being probed now by the newly-elected Congress government of chief minister Kamal Nath. The vice-chancellor of the university, Jagdish Upasane, and its rector Lajpat Ahuja resigned from their posts after the change of government in December last year. Nath’s government constituted a three-member committee headed by Gopal Reddy, additional chief secretary in the state public relations department, to investigate the complaints that the university was promoting a particular ideology, not only through its syllabus but other academic activities as well. P. Narahari, the acting vice-chancellor of the university, confirmed that the committee has been constituted, and its report is awaited. But the committee has already made its first change — it has brought Jawaharlal Nehru, who had been dumped, back into the curriculum. “We have been receiving a number of complaints about irregular appointments, wasteful expenditure of university resources, a lot of centres being opened up without following the UGC norms, and also about a lot of changes in the textbooks and curriculum without authorisation,” Reddy told ThePrint. The university is likely to declare this year a ‘zero year’, under which the entire syllabus, examination pattern and semester system will be reviewed by the panel. “The entire syllabus will be reviewed and many changes are likely. Even the exam pattern will be reviewed and the exercise will take a few months,” said a source. Speaking to ThePrint, however, professor B.K. Kuthiala, vice-chancellor of the university from January 2010 to March 2018, rejected the allegations of saffronisation, wasteful expenditure and defended the appointment process followed at the university. The university, set up by an Act of the Madhya Pradesh assembly in 1990, is named after Makhanlal Chaturvedi, a renowned freedom fighter, poet and journalist. The Vice-President of India is its Visitor. The changes brought in under the BJP regime that are being reviewed includes the study of the mythical sage Narad “as a communicator”. According to Hindu mythology, the sage was a travelling musician and carried news across the realms. Students were also expected to attend seminars and lectures by Jagadguru Shankaracharya, who stipulated that one should learn from Narad how to be a good journalist. “Ever since the BJP came to power, saffronisation took place. Senior journalists and people associated with the RSS were made vice-chancellors, registrars, and made their way into the faculty too. 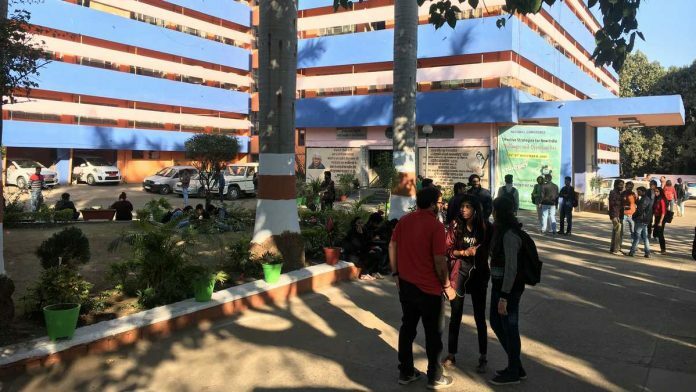 Slowly, they used the platform to bring Right-wing organisations within the campus, and used it as a workshop for their activities,” a senior faculty member alleged. The political thinkers students read at the university once included the likes of Mahatma Gandhi and Nehru. But while thinkers like Deen Dayal Upadhyaya and Ram Manohar Lohia were made part of the curriculum, Nehru was unceremoniously dumped under Shivraj Singh Chouhan’s government. However, days after the committee started work, a subject on Nehruvian socialism was brought back, and will be taught to the fourth semester students, alongside the other thinkers. The university is now waiting for the final report of the committee, which is likely to suggest more changes in the syllabus. Some professors also alleged that university funds were used to publish literature, and hold seminars and events favouring a particular ideology. For instance, it published a booklet on the impact analysis of Article 370, when former V-C Kuthiala was in charge. The booklet, which runs into 20 pages, cites the impact of Article 370 on women, and gives the example of former J&K chief minister Farooq Abdullah’s family. Abdullah married a British citizen, Molly, who became a permanent resident of Jammu and Kashmir by “virtue of marrying a male permanent resident of the state, and similarly her children, Omar Abdullah and Sara Abdullah”. However, the booklet says while Omar got married to a Punjabi, an “outsider” who also became a permanent resident of J&K, Sara and her children “cannot be citizens of the heaven on this planet the state of Jammu and Kashmir” as she married someone outside from the state, current Rajasthan Deputy CM Sachin Pilot. Apart from the Bhopal campus, the university has centres in Khandwa, Amarkantak, Rewa, Datiya, Gwalior and Noida, Uttar Pradesh. The total student strength across these centres is 2,500, of which 1,300 study at the Bhopal campus. But the new government’s rise to power last December was soon followed by the announcement that the centres in Amarkantak, Datiya and Gwalior would be shut down from the new academic year. Some people in the university administration, on the condition of anonymity, alleged that a number of these centres were opened up for use as “workshops for the RSS”. An example of this is the Jammu Kashmir Adhyayan Kendra, an RSS-linked study centre, which has held a number of projects and seminars in the university. “There were not more than 180 students altogether in these centres that are being shut down, and we were spending approximately Rs 30-40 lakh on them. A decision on closing Rewa is also yet to be taken. These centres were created to use them for workshops and seminars by RSS-affiliated organisations,” a senior university official said. Reddy also confirmed that the university was not authorised to open centres outside MP, but it went ahead and did so in Noida, UP, which now has about 600 students. There has been no decision on whether this centre will be shut down. There have also been a lot of alleged irregularities in the appointment of staff and faculty, which are under the scanner of the committee. Reddy also said a number of research projects and PhDs were awarded in a fashion which “ought not to have been done”. “People who do not have the qualifications have been given the posts which they are not qualified to hold. Some kind of contractual employments were given where people were not doing any kind of work, and this was like a dole for these people,” he said. Kuthiala told ThePrint that to associate the university with any particular ideology or organisation is “not only incorrect but also malicious in nature”. “The past 15 years should be viewed as a journey from print journalism to electronic media and then to new media. The number of courses and student strength has multiplied more than five times during this period,” he said. On the issue of appointments, Kuthiala said the entire process was transparent and no issue arose before 2019. Kuthiala also defended the appointments of teachers, technical staff and secretarial staff, saying none was made without advertisement and due process of selection was always followed. Students of the university are now caught in this political battle, with many pointing fingers at the lack of infrastructure, laboratories and quality faculty. “We are a journalism school and teaching theory is fine, but there should be more practicals. Our labs are not equipped at all,” said Rupali Tyagi, a student at the university. “At times we have had faculty who have merely done their Masters and are not even specialised to teach us. More than worrying about what ideology to remove and bring in, they should concentrate on improving the infrastructure and quality of the institute. Students are hopeful that after the inquiry, major structural changes will be made to the university. “Every party has its ideology and the best thing would be not to have any ideology on the campus. We are here to learn,” said Isa Ahmad, a student. This report has been updated with a reaction from P. Narahari, the university’s acting V-C. Gopal Reddy’s designation has also been corrected to additional chief secretary. I welcome changes wherever distortions have been done in regard to history of Indian freedom struggle.I, personally hold Narendra Modi responsible for the ideology bises.Should he return as PM there is a danger of more irreversible changes happening that would harm to India.